Last night was an evening filled with joy, beauty, delicious food, and a great deal of fun! Our Bible Study Leadership celebrated St. Patrick's Day with the traditional Irish meal of fruited salad, Corned Beef, slowly cooked in a crock pot for ten hours, potatoes boiled in water with onions and garlic, boiled carrots and cabbage, and home-made Irish Soda bread. It was amazing. 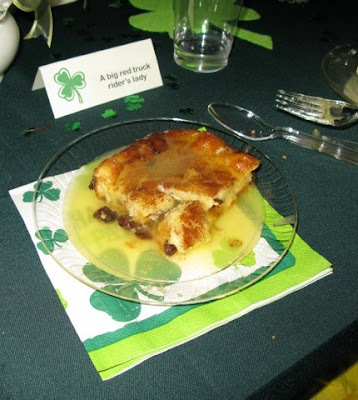 It was followed by a traditional Irish Bread Pudding with a Whiskey Sauce that was sooooooo delicious! The tables were adorned with grocery store flowers embellished with a greeting card cut in half with one side showing the front of the card and the other side featuring the inside sentiment on the other side of the card mounted on a florist pick. Once the flowers were trimmed to the size of the vase they looked so much fuller and more expensive than the grocery store flowers that they were. Riddles of the ladies first or last names were printed for the name tags. We all had fun trying to figure the riddles out. It was a great way to set the mood of the evening-Happy Go Lucky! Each woman was asked to describe what she would purchase for herself if she won a large pot of gold. The answers were fun to listen to and things I will long remember about my dear friends. It was a very delightful evening!